The winner of the 2014 Double Diamond Award is the Beartooth Back Country Horsemen (BBCH) of Montana. The Beartooth Back Country Horsemen of Montana (BBCH) members won the the award for their efforts by spearheading the largest coalition of volunteers and government ever to open the Ernie Strum Trail––a trail to Lily Pad and Crater Lakes in Montana. Here is the full paper presented at the 2015 BCHA Annual Meeting including the letters of support from the many involved agencies. The idea of a four-part trail complex to provide public access to McDonald Basin and the North face of the Beartooth Mountain Wilderness took root in 1999. This area lies between the West Rosebud valley and the old Benbow mine. Located just outside of the official wilderness boundary, but just as remote, primitive and secluded as if it were officially wilderness, it contains the headwaters drainage’s of Fiddler and Fishtail creeks including the forks of each. The West Rosebud is a magnificent, beautiful scenic valley leading to the heart of the Beartooth Wilderness that has never had horse trail access, apart from a short hunting season exception. However, it is one of the most popular and most used areas, with two developed Forest Service campgrounds but only one overused trail. Blocked by private holdings, the adjacent McDonald basin has no open public access short o f a very tough bushwhack, and certainly not horse accessible. See attached Supporting Documents for map of the area. Due to its high altitude, the upper reaches of the Beartooth country provides a short trail-user season; however, the North Face and McDonald basin area is a much lower elevation giving a seven to nine month user season. 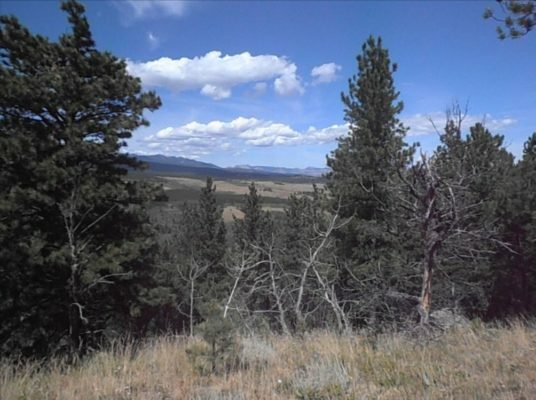 The terrain definitely lends itself to being an awesome recreational area, full of opportunities and was described to BBCH by Montana Fish Wildlife & Parks biologist as the most bio-diverse area in Montana. “It feels good to see something wild and free.” This is a new, non-motorized, trail starting at the edge of a backcountry county road as it passes through a short section of Bureau of Land Management (BLM) land surrounded on three sides by privately owned ranch companies. That land and our new trail-head entry had been posted and blocked by a livestock fence for well over 80 years. The fourth side abuts a Montana State owned school section, containing Lily Pad and Carter Lakes, which happens to be adjacent to the US Forest Service land. 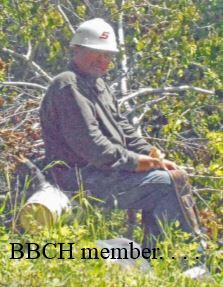 Ernie Strum and other BBCH members had been told by “ole timers” of old, long abandoned hunter and sheepherder trails in this area. BBCH members began to talk the “vision” to all that would listen. The seed sprouted and really began to grow in 2003 when the, NEW, BLM Recreational Planner was asked to contact the Montana Fish, Wildlife and Parks (FW&P) Regional Biologist about access to stock fish in Crater Lake. The following year she and the BLM Field Manager hiked from the West Rosebud road over the ridge into the State School Section containing the lakes, while talking about public access and seeing the added recreation opportunities potential. 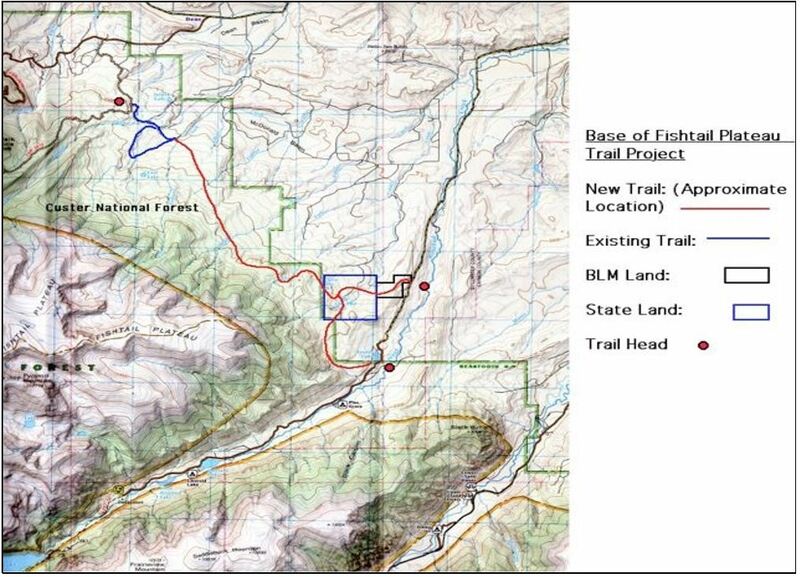 The FW&P stocked Crater Lake with Rainbow trout and they continued to consider a public access trail to the lakes. In 2005 BBCH members, the new BLM Recreational Planner and a Crow historian were planning a group weekend campout for the BBCH and Montana Wilderness Association with tours of the Native American artifact sites of the area. During that day we learned by chance of each other’s desire to build a trail through their land to Lilly Pad and Crater lakes. Perhaps “fate” played a roll! With the circle now complete, the balance of 2005 was used to continue building a coalition of willing and motivated partners to bring this project to fruition. 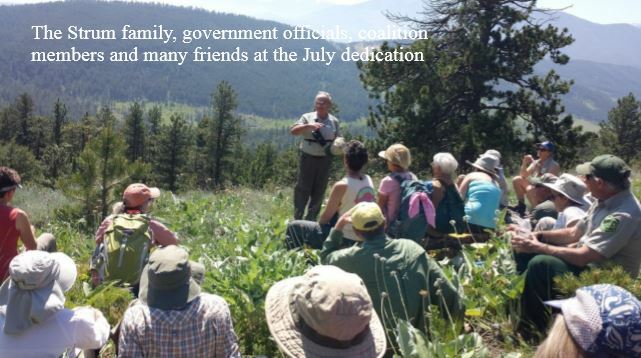 To start, a representative of Montana Department of Natural Resource Conservation (MT DNRC), BBCH members and Ernie set up a coalition meeting at the DNRC. At that meeting it was learned that the BLM land was not surveyed, so Ernie set about to fix that problem, which he accomplished. He asked Red Lodge Surveying to be a partner, the answer was yes, and a $20,000 survey was donated. This project ultimately involved FIVE government agencies plus FIFTEEN private entities and numerous individuals (see attached Supporting Documents for a complete list of participants), which took tremendous coordination by BBCH. As we look back, it was and is truly an All American accomplishment. Creating good and big dreams does take time but by putting all of these minds together we definitely created abundant synergy. During the period of 1999 to 2007 BBCH pitched the project to various groups and held group meetings, which grew larger as the coalition grew, and the project edged closer to reality. The public reaction was and continues to be overwhelmingly supportive. In early May 2007 BBCH planned a spring campout and barbecue for the coalition of government agencies and volunteers. Camp was set up under beautiful skies that clouded over by early evening. By mid-morning a heavy spring snow caused us to cancel the planned camp out. But the Forest Service and the BLM are like the mail carriers––the snow didn’t slow them up–– they are tough. Since the walk to the lakes was out of the question it was decided to talk about the Lily Pad trail and to go visit the possible trailhead locations. So 20 or more people gathered in a fifth wheel camper as the snow continued. We thanked the public servants on behalf of the BBCH for what they do. We showed the proposed trail location on aerial photos. The USFS representative explained how there were 15 miles of Forest boundary between Dean and the West Rosebud Road with no access. He stated that the Forest policy strives for one access point in every 5 miles and agreed the McDonald basin needed a trail behind the private land. All concurred that a small parking trailhead was feasible at the BLM location and the Resource Advisory Committee (RAC) will be back on site in July. After visiting the trailhead locations and the discussion of the morning a goal had been set and accepted by everyone. 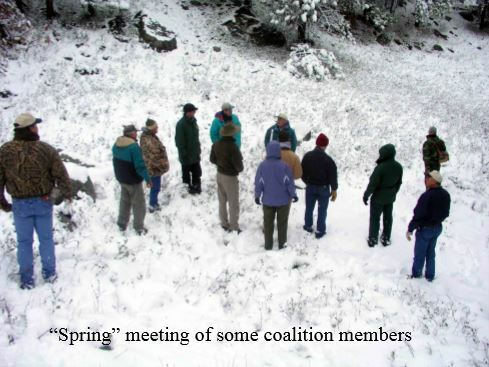 The snowy campout was the beginning of the unbreakable bonding of that coalition, which holds today. We refer to this as a coop project because of the long list of organizations and individuals now actively involved. The support of such a diverse group brings talent and resources to the table that brought this project to fruition even in times of tight budgets. We believe that a project of this magnitude, with such an array of volunteer organizations working alongside so many governing entities can only lead to more seamless societal operation well into the future. This coop support will ultimately provide sustainability of trail upkeep because of the ownership gained by these participants. We are confident that it will serve as a model for those that follow. The following years involved the EIS process, and then the actual on the ground non-motorized trail building, as funding permitted. The BLM Field Manager and the BLM Recreational Planner guided the construction while the USFS surveyed, plotted and marked the trail location on BLM land. By now Ernie was on the BLM RAC committee which enabled better coordination from the inside. Many horsemen and other organizations donated their time and hard labor during the next years. 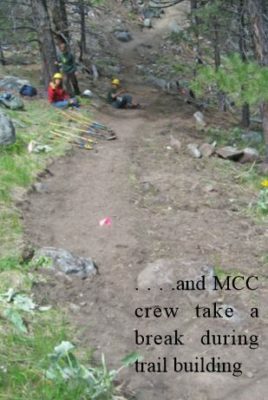 In 2014 alone, a very busy Spring and early Summer of final construction; 480 hours labor, equating to nearly $17,000 plus 2,953 miles and signage were donated by BBCH members and partners in assisting Montana Conservation Corps (MCC) crews doing the trail building. In addition, BBCH chapter shared the actual dollar costs with BLM. MCC put us over the top by donating some weeks of crew labor in the construction process with a valuation in 2014 alone of 232 hours, equaling nearly $10,000 and 935 miles. One 2014 event among many stands out; that of the MCC crew, all younger folks, deciding all on their own to save a mature, stately pine tree in the middle of the trail corridor. They built a roundabout for the trail, around the tree, thereby saving that tree in the median. The Tribute The trail was first called the Lily Pad Lake Trail but was officially named the Ernie Strum Trail after his passing in late 2013, to commemorate his long and tireless work on the project. This tribute brings significance to the project, as this naming practice has not been used for many years. 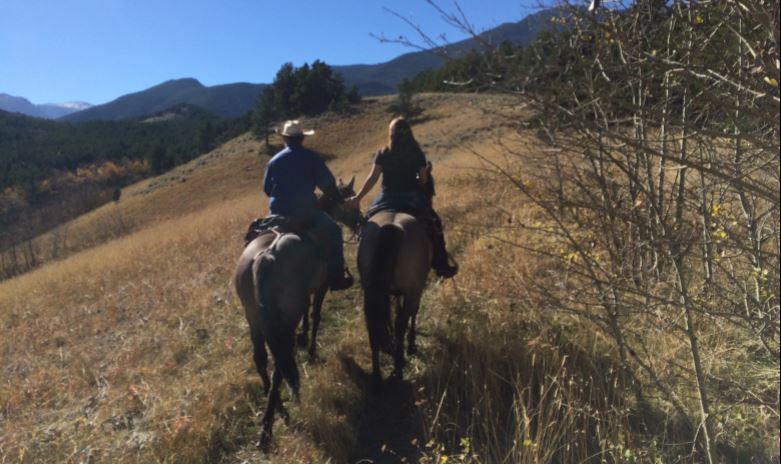 Ernie, a Beartooth Back Country Horseman from the first days of the organization, also brings lasting recognition and tribute to Back Country Horsemen by this partnership. 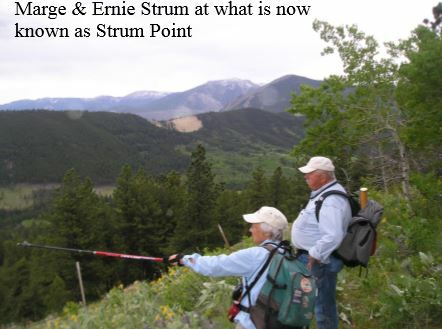 By July 2014 the trail was completed with an additional side trail to a beautiful scenic overlook on BLM land we call Ernie’s Point, a place that will awaken your senses. A volunteer built wooden benches on site from timber removed from the trail corridor for visitors to use as they take in the fantastic views. We hope to make this site an interpretive site because of the area’s geology and awesome views of the North Face of the Beartooth Mountains. July 3, 2014 was selected for the official opening, and a dedication ceremony was held at Ernie’s Point, the eve of July 4th was noted as very appropriate for this “All American Project”. Approximately 90 people, including the Strum family, government officials, coalition members and friends made the nearly 1 mile uphill hike to attend and express thanks to all partners. The BLM Recreational Planner officiated at the ceremony. BBCH members paid a fitting salute to the late Ernie Strum, and numerous other attendees spoke about the effort of making this project a reality and how great they felt about their successful efforts. After the dedication many walked another two miles to the lakes, had a trail snack and quiet reflection on the shore of a beautiful high country lake. They returned to the camp ground for another BBCH hosted barbecue. The Montana FW&P provided free permit licensing for all the event attendees. We know the contributions made by all individuals are a source of extreme personal pride and ownership in this project. It is that ownership that will ensure this project lives forever. The key to this project’s success lies in BBCH being a group of people who have the well-earned reputation of placing their money, time, talents, and labor on the table, asking only for sharing partnerships. 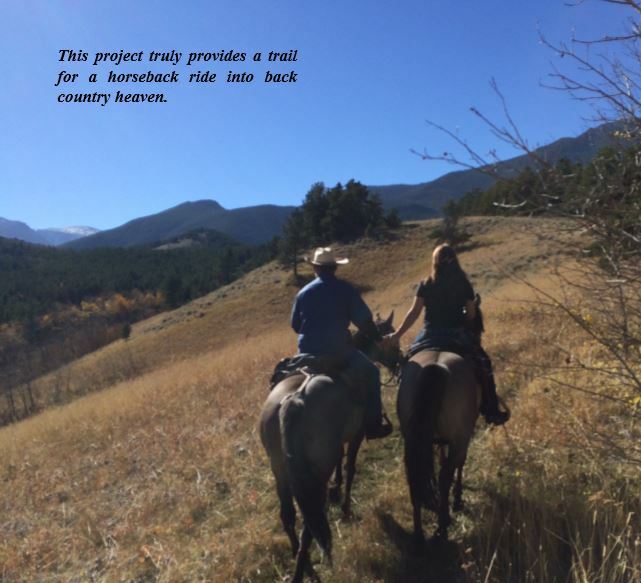 This project truly provides a trail for a horseback ride into back country heaven. In closing, we state that the recognition of this project with this award will provide immeasurable benefit toward the next two finishing projects of the vision. Montanans dream big, to match their sky.